This is a procedure involving the injection of a steroid solution into abnormal skin to either improve its appearance or to reduce symptoms such as itch or pain. Steroids are naturally-occurring hormones, produced mainly by the adrenal glands. There are different types of steroids, and the type most commonly used to treat skin problems is known as a “corticosteroid”. Corticosteroids have multiple mechanisms of action, but it is their effects on suppressing inflammation and on reducing the amount of collagen in the skin that are particularly useful in the treatment of skin conditions. 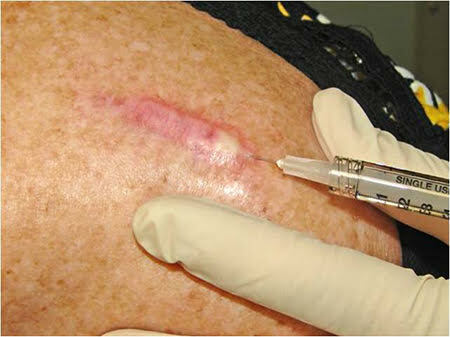 The injection of a steroid into the skin has two advantages over topical and oral steroid treatment; firstly, it will often be more effective in treating deep-seated conditions than a steroid cream or ointment, and secondly, it will only affect the area in which it is injected rather than have the systemic effects of a steroid taken orally. The most common uses of intralesional steroid therapy are in the treatment of excess scar tissue (hypertrophic or keloid scars), acne cysts and alopecia areata (a form of hair loss). However, your dermatologist may recommend it for a variety of other skin conditions, including nodular prurigo, discoid lupus erythematosus and sarcoidosis. Intralesional injection of a steroid is done in the rooms, with no special preparation involved. Although the area to be treated can be numbed with a local anaesthetic, this is not normally necessary; the discomfort of the steroid injection is very similar to that caused by injection of local anaesthetic. In addition, when treating keloids, the area is first treated with liquid nitrogen therapy which in itself works as an effective anaesthetic. Depending on the size of the area to be treated, several injections may be required. Following your treatment, we will place a small dressing over the injected site which can be removed after a few hours. Depending on the condition being treated, you may be offered further treatment sessions, usually a month apart. Intralesional steroid therapy is, by and large, a safe procedure, and will not cause you to put on weight or develop excess hair. The amount of steroid injected at any one time is tiny, and the risk of steroid being absorbed into the bloodstream in sufficient amounts to produce internal side effects is very low.